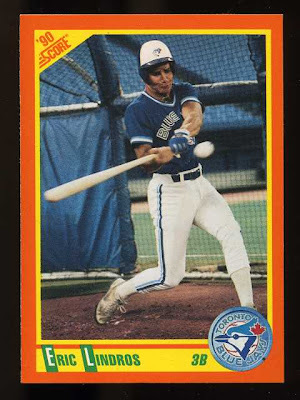 Before the Legion of Doom There Was...Third Base for the Blue Jays?? It never ceases to amaze me what kind of interesting cards you will find when looking through a box of commons. I came across the card below when doing just that. I had no idea that Eric was a baseball player, and this was before he played in the NHL. It says on the back of the card that he is expected to be the first pick in the 1991 NHL draft. I checked Baseball-Reference and they have no stats for him, so I'm assuming he didn't make it past the tryout stage. But it's still a cool card. OK, the 1989 Bill Ripken card is not really a part of their list, but the rest are. Those ten cards by themselves would make up a very nice collection. I normally just collect baseball cards, but the other day I picked up a blaster box of Donruss Americana in a moment of weakness due to Walmart's clever marketing strategy of mixing up all their blasters in apparently random order. They'll tell you it's just from customers moving them around. I don't believe them. Plus I wanted to see what all the hype was on this Donruss Americana product. The cards are nice. I probably won't buy any more of them, but they are nicely produced. 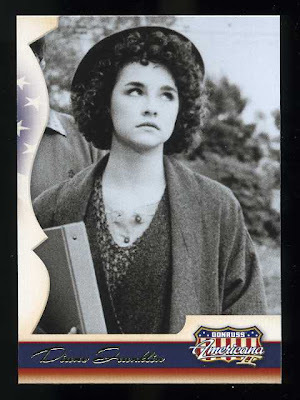 The prize of the box was this Diane Franklin card...aka French foreign exchange student Monique from the 1985 cult classic Better Off Dead. Definitely one of my all-time favorite movies. Better Off Dead was the inspiration behind my first car, a 1968 Camaro, black just like John Cusack's 1967 Camaro in the movie. It had plenty of skiing in (one of my favorite sports), Van Halen music with an animated hamburger playing Eddie's distinct red and white guitar, a great shot of the Camaro on the field of Dodger Stadium (not sure how he pulled that one off) and of course great humor. What's not to like?